by David T. King, Jr.
Late Cretaceous dinosaurs of the southeastern U.S. comprise 46 specimens that are divided into four taxonomic groups: tyrannosaurids (12); hadrosaurines (22); ornithomimids (12); and nodosaurs (5). These same taxomomic groups characterize the balance of eastern North American dinosaurs from New Jersey-Delaware-Maryland. The first three taxonomic groups above occur first in strata that are significantly older than any related first occurrences in both western North America and the Atlantic Coastal Plain north of North Carolina, and these three groups may have entered eastern North America directly from Asian or European habitats via an Atlantic Ocean crossing. In contrast, the southeastern nodosaur group is younger than counterparts in western North America and Europe. Regarding the Western Interior Seaway, third-order sea-level falls seem to have affected timing of dinosaurian migrations into and out of eastern North America. Further, Late Cretaceous southeastern paleogeography and thus amount of dinosaur living space was strongly affected by third-order sea-level changes. There are three modes of occurrence of dinosaurian bones: (1) shallow-marine concentrations; (2) shallow-shelf tempestites; and (3) shelfal accumulations. Since 1858, ninety-nine different partial to nearly complete specimens of Late Cretaceous eastern North American dinosaurs have been described in paleontological literature (discussed in King, 1996). Late Cretaceous dinosaurs from southeastern states are a significant subset of known eastern North American dinosaurs (Table 1). Most eastern North American Late Cretaceous dinosaur specimens come from the New Jersey-Delaware-Maryland coastal plain (50); others are from Alabama (21), Mississippi (10), North Carolina (10), Georgia (6), Missouri (1), and Tennessee (1; Figure 1). Ninety of the 99 known dinosaur specimens are Campanian and (or) Maastrichtian, and all others are from older, Cenomanian-Santonian strata. This paper discusses dinosaurs from sites other than Missouri and New Jersey-Delaware-Maryland. Eastern North America's dinosaurian record encompasses taxonomic groups: tyrannosaurids, hadrosaurines, ornithomimids, and nodosaurs (King, 1996). These four taxonomic groups are divisible into twelve generic groups (Table 1). In Table 1, "genus unidentified" means that published description of its limited partial remains does not permit identification of genus. Further, "unknown older theropods" (under tyrannosaurids in Table 1) is a group that is seemingly unrelated to Albertosaurus and (or) Dryptosaurus because they are significantly older (King, 1996). King (1996) presented evidence that suggested an apparent spatial and temporal distributions of published dinosaur occurrences indicate two apparent trends. First, none of twelve generic groups listed in Table 1 simultaneously occurs first in all geographic locations throughout eastern North America. Second, most generic groups in Table 1 occur first in southeastern states (i.e., Alabama, Mississippi, or Georgia) and only later appear in northern Atlantic Coastal Plain states (i.e., New Jersey, Delaware, or Maryland). These spatial and temporal trends are not an artifact of missing stratigraphic section (King, 1996). While much has been written about western North American dinosaurs, there is relatively very little about their eastern counterparts. Only one recent paper addresses models of eastern North American dinosaurian taphonomic and biogeographic processes (Schwimmer, 1996). Textbooks ignore eastern North American dinosaurs or give them very brief mention (e.g., Fastovsky and Weishampel, 1996; Lucas, 1997). Two books have emerged on eastern North American dinosaurs (King, 1996; Weishampel and Young, 1996), yet a significant synthesis of eastern North American dinosaur occurrences and their implications has not been published. Herein, I attempt to partially fill a void in existing literature about eastern North American dinosaurs by (1) synthesizing available dinosaurian spatial and temporal data and (2) making preliminary observations about probable dinosaurian paleogeography, modes of occurrence, apparent migratory patterns, preservation bias, provinciality, and predator-prey ratios that need further investigation and testing. To understand southeastern U.S. dinosaurian modes of occurrence, and those of eastern North America in general, one must understand eastern North American paleogeography adjacent to the Appalachian Mountains during Late Cretaceous (Figure 2). Dinosaurs probably inhabited a narrowly restricted zone of coastal lowlands (alluvial plains) and supratidal reaches of linear coastlines adjacent to the Appalachian Mountains (King, 1996). In southeastern states, especially Alabama, Georgia, Mississippi, and Tennessee, coastal lowlands formed an arc around the prominent Appalachian headland. Minor third-order fluctuations in relative sea level probably caused alternate innundation and exposure of coastal lowlands (comprising both dwelling habitats and migration routes), and zero width of coastal lowlands is highly probable during some third-order sea-level high-stands (King, 1996). Three modes of occurrence are evident in Late Cretaceous southeastern U.S. stratigraphy: (1) shallow-marine concentrations; (2) shelf tempestites (or sandy event beds); and (3) open-marine accumulations (Figure 3a-c; King, 1995; 1996). Shallow-marine concentrations, consisting of mixed assemblages of dinosaurian and other bones and teeth within sands, are local fossil-conglomerate lenses of broken, rounded, sorted, and abraded vertebrate hard parts. Shallow-marine concentrations are products of clastic shoreline swash and backwash processes that could easily have segregated any such coarse materials at or near the Late Cretaceous shoreline (Figure 3a; King, 1995; 1996). Shelf tempestites (or sandy event beds) are fining-upward (graded), clastic strata deposited initially by low-slope turbidity current flow across an inner shelf and reworked by deep-acting storm waves (Figure 3b). In inner shelf facies, tempestite beds form thin tongues that are intercalated and preserved within shelfal hemipelagic deposits (King and Skotnicki, 1994b). Shelf tempestites contain bones from shallow-marine concentrations mixed with transported shoreline sands. For a complete discussion of the nature and origin of shelf tempestites in the Upper Cretaceous of Alabama, the reader is referred to the paper by Skotnicki and King (1994b). In open-marine accumulations, a peculiarly common mode of occurrence within Upper Cretaceous hemipelagic (marly chalk) facies of southeastern states, simple floatation of a dinosaurian cadaver into deep-water shelfal areas is the only mechanism involved (Figure 3c; Langston, 1960; Schwimmer, 1996). Such a cadaver, dried on its top side and moist and decayed on its under side, was likely swept from nearshore realms to a shelfal depositional site by waves and offshore currents. Today, decayed flesh and heavier bones tend to be quickly separated from comparable cadavers by waves and scavengers, and thus partially articulated sections of originally complete specimens are transported shelfward (Langston, 1960). Dinosaur bones transported by cadaver are found in association within a stratum of hemipelagic sediments, usually marly chalk or chalky marl (King et al., 1988; Schwimmer et al., 1993; King, 1995; 1996). Such dinosaurian bones are pristine, unabraded, whole, and essentially unaltered. However, the bones may be distorted by compaction of enclosing sediments or damaged by late diagenetic growth of interstitial calcite. In this mode of occurrence, bones from one individual and no other bones are found together. Dinosaurian taxonomic groups and dinosaurian modes of occurrence have no apparent relationship in either southeastern U.S. or eastern North American sites that are discussed in paleontologic literature and discussed herein (Langston, 1960; Schwimmer et al., 1993 and 1996; King, 1996). Tyrannosaurids of eastern North America consist of apparently equivalent genera, Albertosaurus and Dryptosaurus. According to Paul (1987), no data suggests a substantial difference between Albertosaurus and Dryptosaurus, thus they could be treated as a single tyrannosaurid population. Among specimens identified as to genus, Albertosaurus has been assigned in southeastern states, and Dryptosaurus in northern Atantic Coastal Plain states (New Jersey-Delaware-Maryland). I include in this Albertosaurus-Dryptosaurus generic group all "genus unidentified" specimens (i.e., group II, Table 1), but exclude an apparently separate population of three "unknown older theropods" (i.e., group III, Table 1) from New Jersey's Cenomanian and (or) Coniacian. Southeastern tyrannosaurids from Alabama and Mississippi occur first in strata that may be as old as mid-Santonian and have a last known occurrence which may be as young as mid- Maastrichtian (Figure 4). In contrast, New Jersey-Delaware tryannosaurids occur in rocks as old as earliest Campanian to as young as latest Maastrichtian (Figure 4). Thus, apparently, eastern North American tyrannosaurids dwelt in southeastern areas before populating northern Atlantic Coastal Plain areas, but northern Atlantic Coastal Plain areas were home for tyrannosaurids longer than in southeastern areas (King, 1996). In mid-Campanian, relatively advanced species of Albertosaurus, A. arctunguis Parks, A. libratus Lambe, and A. sarcophagus Osborn, first occur simultaneously in Alberta on the Western Interior Seaway's western side (data from Paul, 1987 and Weishampel et al., 1990). King (1996) notes that Albertosaurus' first occurrence follows, and may be related to, a rapid, 120-m sea-level fall at mid-Campanian (see 80 Ma in Figure 5). In rocks older than Albertosaurus' first occurrence in Alabama and Mississippi, an ancestral form, A. olseni (Gilmore), is described only from Mongolia and China (Paul, 1987). Therefore, Albertosaurus' spatial and temporal distributions suggest an migration into Alabama and Mississippi directly from far eastern Asia. This migration hypothesis requires an Atlantic Ocean crossing during the Santonian, a route that is not clearly feasible judging from most published paleogeographic maps (e.g., see Smith et al., 1994). Among known hadrosaurines, Lophorhothon atopus Langston (i.e., group I, Table 1) occurs in strata that ranges in Alabama from as old as earliest Campanian to as young as mid-Maastrichtian and, in North Carolina, from mid- to latest Campanian (King, 1996). From across the southeastern U.S., a substantial number of specimens (i.e., 19 of 33 comprising group IV, Table 1), are lumped together herein as "genus unidentified." Their age range is from as old as mid-Coniacian in Mississippi to as young as mid-Maastrichtian in Alabama and Tennessee. Larger and distinctly different hadrosaurine genera, Edmontosaurus and Hadrosaurus of group II, Table 1, occur only in Late Cretaceous strata of New Jersey-Delaware-Maryland, and these specimens are at most middle-early Campanian and at least latest Maastrichtian (King, 1996). Among the southeast's 19 "genus unidentified" specimens (i.e., group IV, Table 1), it is unclear how many specimens might be Edmontosaurus or Hadrosaurus versus Lophorhothon. Four Mississippi "genus unidentified" specimens are provisionally referred to Hadrosaurus, but these referrals lack significant documentation (Russell, 1988; compiled by King, 1996). A group of three specimens (including Hypsibema crassicauda Cope from North Carolina) previously thought to be sauropods are included here as a division among hadrosaurines (i.e., group V, Table 1). Among lambeosaurines (i.e., crested hadrosaurs of group III, Table 1), one "genus unidentified" specimen with a possible age range from mid- to latest Campanian is known from North Carolina. One early to mid-Maastrichtian lambeosaurine, "genus unidentified," also occurs in New Jersey-Delaware-Maryland (King, 1996). Clearly insufficient documentation exists to determine trends in lambeosaurine distribution. As with southeastern tyrannosaurids, two general trends emerge from spatial and temporal data on southeastern hadrosaurines. 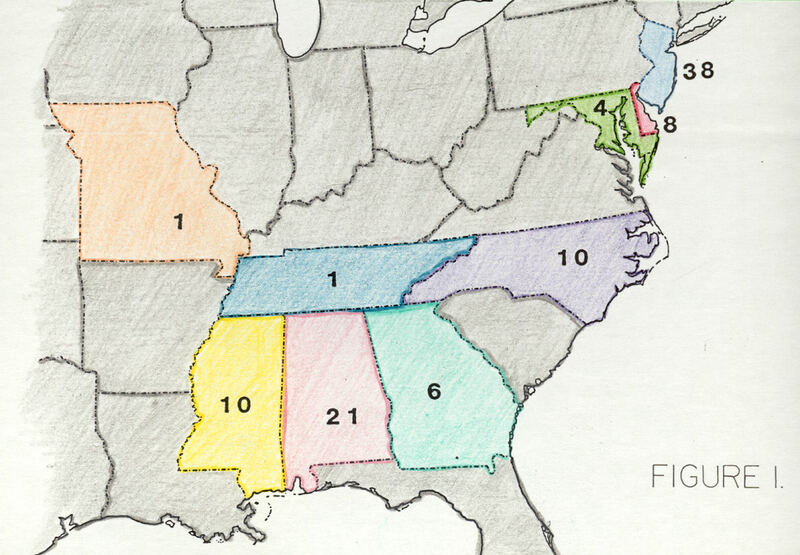 First, first occurrences are older in southeastern states than more northern locations (Figure 4). For example, certain specimens of Lophorhothon atopus are found in rocks as old as earliest Campanian in Alabama, but mid-Campanian in North Carolina (King, 1996). Similarly, "genus unidentified" hadrosaurine specimens are found in rocks as old as mid-Coniacian in Mississippi, but earliest Campanian in New Jersey-Delaware- Maryland (King, 1996). Second, considering that definitive hadrosaurine specimens have not been found in rocks older than mid-Campanian in areas west of the former Western Interior Seaway (Weishaphel et al., 1990), the oldest hadrosaurines of southeastern states are much older than similar western forms. Whether southeastern hadrosaurines were direct ancestors of western North American hadrosaurines is problematic and would require establishing an evolutionary lineage between Lophorhothon atopus and western genera like Hadrosaurus and Edmontosaurus. Fastovsky and Weishampel (1996) hint at such a lineage in their discussion linking "solid-crested saurolophs" including Lophorhothon with "flat-headed edmontosaurs." Relative to hadrosaurine migration and ancestral relations, King (1996) notes a rapid, mid-Campanian sea-level fall of 120 m (see 80 Ma in Figure 5) that is very nearly coeval with maximum age of first occurrence for western North American hadrosaurines. Perhaps this rapid and deep sea-level fall opened the door for migration of ancestral eastern hadrosaurines (as well as tyrannosaurids) to western North America? If an ancestral stock of eastern North American hadrosaurines came from Asia and (or) Europe (as inferred from data and interpretations in Weishampel et al., 1990 and Fastovsky and Weishampel, 1996; also see King, 1996), an Atlantic Ocean crossing, despite possibly unfavorable paleogeography, is again inferred. This hypothesis affords a simplest way to explain hadrosaurine spatial and temporal distributions just noted. Among ornithomimids of group I (Table 1), three specimens of Ornithomimus (Coelosaurus) antiquus (Leidy) occur in the Alabama-Georgia Gulf Coastal Plain within strata that range in possible age from earliest to mid-Campanian. The remaining seven specimens from group I (Table 1) occur in New Jersey-Delaware-Maryland within strata that range in possible age from earliest to latest Maastrichtian (King, 1996). Ornithomimids of group II (Table 1) is a collection of twelve "genus unidentified" specimens, four of which show strong affinities with Coelosaurus antiquus (discussion in King, 1996). Specimens from group II occur first in strata that may be as old as earliest Campanian in Alabama, mid-Campanian in North Carolina, and earliest Campanian in New Jersey-Delaware-Maryland. Respectively, these specimens may be as young as mid-Campanian in Alabama, latest Campanian in North Carolina, and latest Maastrichtian in New Jersey-Delaware-Maryland. As no other ornithomimid is known to occur in eastern North America, I make a parsimonious assumption that "genus unidentified" specimens generally belong within Ornithomimus' (Coelosaurus') generic group. 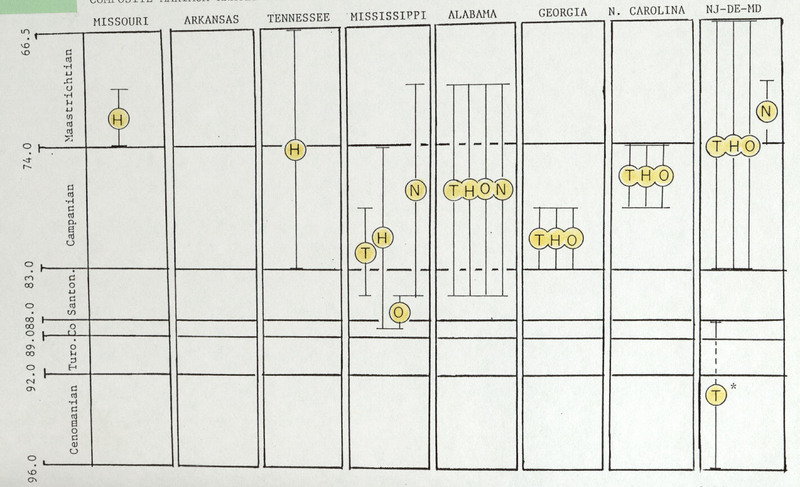 A problematic Mississippi specimen (i.e., group III, Table 1) from strata ranging in possible age from mid-Coniacian to mid- Santonian is questionable and may be a dromaeosaurid (Carpenter, 1982). Excluding Mississippi's problematic specimen, spatial and temporal range distributions of all ornithomimids shows a first occurrence slightly older both southeastern states versus New Jersey-Delaware-Maryland (Figure 4). If Mississippi's specimen is included, previously established pattern as with tyrannosaurids and hadrosaurines is further supported: all oldest specimens of a taxonomic group come from southeastern U.S. sites (Figure 4). Ornithomimus antiquus was apparently restricted to eastern North America and that name is not used in reference to specimens from elsewhere. Probable O. antiquus descendents, O. edmontonensis Sternberg and O. velox Marsh, are respectively, a late Campanian- early Maastrichtian form and a late Maastrichtian form (Weishampel et al., 1990). Thus, the previously established pattern applicable to tyrannosaurids and hadrosaurines holds for ornithomimids. Specifically, older ancestral ornithomimid species occur first in eastern North America, and only later in western North America. Timing and mode of ornithomimid migration, east to west, across the Western Interior Seaway may have been facilitated, as with tyrannosaurids and hadrosaurines, by a rapid, 120-m mid-Campanian sea-level fall (see 80 Ma in Figure 5). Ancestral forms of eastern North American ornithomimids, presumably Archaeornthomimus asiaticus Gilmore (Russell, 1972), a species as old as Cenomanian (Weishampel et al., 1990), existed in China. A. asiaticus' descendants, Ornithomimus sp. (Weishampel et al., 1990), occur in eastern North America, specifically Alabama, Georgia, and New Jersey-Delaware-Maryland, in rocks significantly older than in other places. As with the foregoing two taxonomic groups, ornithomimid distribution suggests that a northern Atlantic Ocean crossing was possible in Late Cretaceous. I interpret this as a 'simplest explanation' of how ornithomimids arrived in eastern North America. Among all five described nodosaurs from southeastern states, no identification at genus level is published. Uncertain identification is likely an effect of very fragmentary preserved material. Langston (1960, his Figure 160) illustrates a left ilium from a nodosaur found at Harrell's Station, Dallas County, Alabama and favorably compares it to Stegopelta landerensis Williston. However, Langston (1960) is careful not to assign the Harrell's Station specimen to S. landerensis. Later, Weishampel et al. (1990) recorded S. landerensis as a synonym of Nodosaurus textilis Marsh, an Albian to early Campanian nodosaur from western North America (specifically Wyoming and Kansas). According to Fastovsky and Weishampel (1996), Nodosaurus is a nodosaur genus that is "hard to place phylogenetically." They say that Nodosaurus "hovers around a basal relationship with Silvisaurus, Panoplosaurus, and Edmontonia," three of the most advanced nodosaurs. I think it likely that all eastern North American specimens are closely akin to Langston's nodosaur from Harrell's Station, and thus they have a probability of being some species of Nodosaurus. Eastern North America's nodosaur taxonomic group (Table 1), comprised of nine specimens total, occurs in rocks as old as mid- Santonian in Alabama and earliest Maastrichtian in New Jersey- Delaware-Maryland. Respectively, nodosaurs occur last in rocks as young as mid-Maastrichtian both in Alabama and in New Jersey-Delaware-Maryland. Thus, nodosaurs as a generic group fit the previously noted pattern of first occurrence in some southeastern states within significantly older strata (Figure 4). Immigration of southeastern nodosaurs is interesting because it apparently differs from previously discussed taxonomic groups wherein a northern Atlantic Ocean crossing seemed simplest. I interpret southeastern nodosaurs coming from western North America across the Western Interior Seaway according to reasoning as follows. 1. Cretaceous (pre-Albian), relatively primitive nodosaurs from Europe, (i.e., Struthiosaurus transylvanicus Nopcsa) are likely ancestral to Nodosaurus in western North America (Weishampel et al., 1990). 2. In mid-Albian and younger strata of Wyoming and Kansas, Nodosaurus textilis is North America's first known nodosaur. Thus, western North American nodosaurs are much older than eastern forms. 3. A mid-Santonian migration, from western to eastern areas across the Western Interior Seaway is envisioned to account for Nodosaurus in Alabama and eventually in New Jersey-Delaware-Maryland. 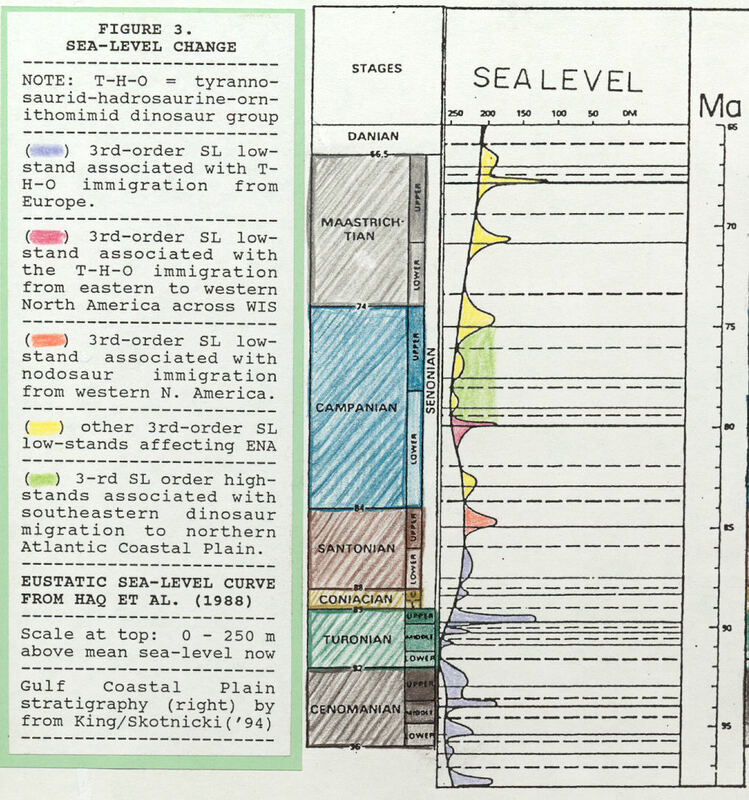 Third-order eustatic sea-level curve indicates a 50-m sea- level fall just after mid-Santonian (Figure 5), and that 50-m sea- level fall may have facilitated migration of nodosaurs into eastern North America. Reasons for a mid-Santonian nodosaurian migration going west-to-east across the Western Interior Seaway, followed by a mid-Campanian tyrannosaurid, hadrosaurine, and ornithomimid east-to-west migration, will remain a mystery for future investigation. Schwimmer et al. (1993) point out a "notable bias toward preservation of distal limb and tail bones" from Georgia and Alabama dinosaurs. This bias is generally present throughout both southeastern U.S. and eastern North American sites, especially those associated with open-marine accumulations as their mode of occurrence (King, 1996). Regarding Georgia and Alabama dinosaur occurrences, Schwimmer et al. (1993) conclude that by "occupying a central position between Atlantic and Gulf Coastal Plains, each with substantial records of Late Cretaceous dinosaur fossils, the ... (southeastern) area invites examination for evidence of dinosaur provinciality ... (but) no such evidence of provinciality appears." They continue by saying, "in (Georgia and Alabama), we find taxa that would be unremarkable in either New Jersey or Mississippi." Southeastern U.S. and eastern North American dinosaur assemblages show a consistent pattern of high fossil predator-prey (p-p) ratios. For example regarding two areas of relatively large numbers of published specimens, Alabama and New Jersey- Delaware-Maryland, King (1996) relates that fossil p-p (i.e., tyrannosaurid-to-other dinosaurs) ratios among specimens found in published literature are 1:2 and 1:4, respectively. Paul (1987) notes that most dinosaurian fossil p-p ratios range from 1:11 to 1:125. Lucas (1997) says that phenomenal dinosaur collections from Dinosaur Provincial Park, Alberta, have fossil p-p ratios of 1:19 to 1:32. King (1996) attributes high p-p ratios in eastern North America to tyrannosaurid cannibalism, and likens the numbers to fossil p-p ratios among Permian sail-back reptiles (e.g., Dimetrodon) that have fossil p-p ratios between 1:1 and 1:5 (Paul, 1987). Paleogeographic reconstructions of separate emergent continental land masses in western and eastern North America show that those two land masses were in closest proximity at opposing headlands in two locations. These locations were in the vicinity of North and South Dakota (approximately 45o N in Late Cretaceous) and Oklahoma-north Texas (approximately 30o N at same time; Figure 2). These likely trans-Western Interior Seaway connections could have been routes of migration during third-order episodes of Late Cretaceous eustatic sea-level fall and brief low-stand. As noted earlier, it is unclear based on most modern paleogeographic reconstructions just how tyrannosaurids, hadrosaurines, and ornothomimids could have crossed an emerging northern Atlantic Ocean which is generally presumed to have been open, albeit narrowly, to arctic waters by Late Cretaceous (e.g., see maps in Smith et al., 1994). Atlantic passage was apparently "nodosaur-proof," as no known European nodosaurs are found in eastern North America. Western North American nodosaurs probably had their origins in western Europe and a probable ancestor there, Acanthopholis horridus Huxley, may be inferred from analysis by Weishampel et al. (1990). However, for this assumption to be correct, ancestral nodosaurs must have followed a polar route (i.e., a Bering crossing) to enter western North America (Lucas, 1987; see discussion in King, 1996). Subsequently and just after mid- Santonian, Acanthopholis' descendent, Nodosaurus sp., may have crossed into eastern North America. Reasons are unknown why other, strictly western dinosaurian taxonomic groups did not similarly cross into eastern North America owing to a rapid sea- level fall just after mid-Santonian. 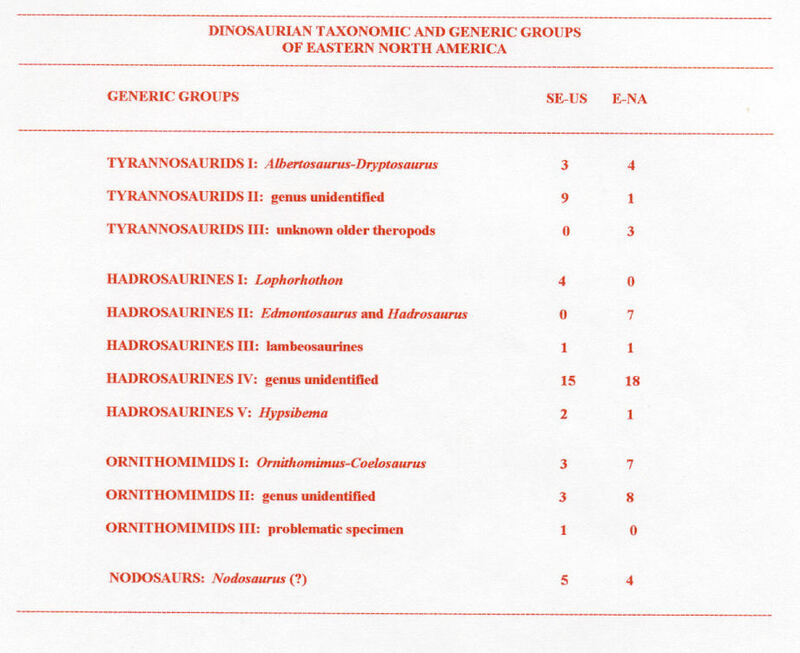 Possible absence and apparent low density of tyrannosaurids, hadrosaurines, and ornithomimids in eastern North America before mid-Santonian (Figure 4; King, 1996) may account for those taxonomic groups not crossing into western North America when nodosaurs came to the east. In Late Cretaceous, eastern North America's most prominent positive physiographic feature was the Appalachian Mountains. Most paleogeographic reconstructions showing any northern Appalachian Mountain terminus indicate no coastal plain at that location (e.g., Smith et al., 1994). Thus, I infer that dinosaurs entering eastern North America from Europe, as tyrannosaurids, hadrosaurines, and ornithomimids are thought to have done, would have had to migrate south across alluvial plains located on the Appalachian's near-western side in order to reach Mississippi and Alabama. 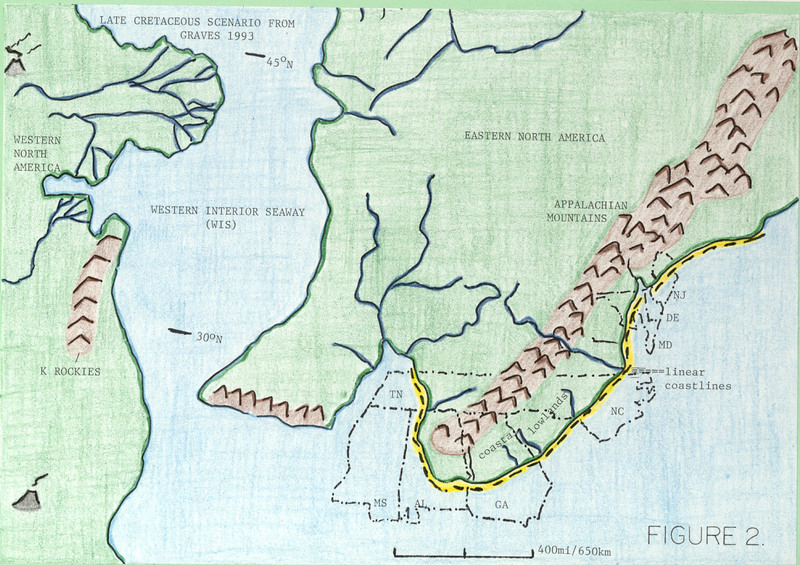 In Mississippi and (especially) Alabama, dinosaurian migration would have been narrowly restricted to a limited, rainforest-covered coastal plain and linear (barrier-island) coastline system (King and Skotnicki, 1994a) situated around the Appalachian's southern terminus. Local flux of dinosaurs, I suggest, was controlled in part by a significant second-order sea-level high-stand (30 m above Late Cretaceous average) that spanned late-early to early-late Campanian and was punctuated by several eustatic sea-level falls (Figure 5). This high-stand may have severely restricted habitats and migration routes on the Atlantic Coastal Plain, and may have forced some species to move to northern locations (i.e., New Jersey-Delaware-Maryland) thus partially isolating these groups. This hypothesis could help account for an apparent pattern seen among tyrannosaurids, hadrosaurines, nodosaurs, and (possibly) ornithomimids of occurring first in southeastern states and later in northeastern states. This web-page contribution is a revised version of a paper published by me in the Gulf Coast Association of Geological Societies Transactions (King and Jones, 1997). Proper citation of the original article is given below in the References Cited below. The resource book, Alabama dinosaurs, 2nd ed., may be obtained by contacting the author at the address given in the by-line or the Auburn University Bookstore. Bryan, J.R., D.L. Frederick, D.R. Schwimmer, and W.G. Siesser, 1991, First dinosaur record from Tennessee: a Campanian hadrosaur: Journal of Paleontology, v. 65, p. 696-697. Carpenter, K., 1982, The oldest Late Cretaceous dinosaurs in North America? : Mississippi Geology, v. 3, p. 11-17. Fastovsky, D.E., and D.B. Weishampel, 1996, The evolution and extinction of the dinosaurs: New York, Cambridge University Press, 460p. Graves, W., ed., 1993, North America in the age of dinosaurs: National Geographic, v. 183, no. 1, Supplemental p. 2A. Haq, B.U., J. Hardenbol, and P.R. Vail, 1988, Mesozoic and Cenozoic chrono-stratigraphy and eustatic cycles: Society of Economic Paleontologists and Mineralogists Special Publication 42, p. 71-108. Horner, J.R., 1979, Upper Cretaceous dinosaurs from the Bearpaw Shale (marine) or south-central Montana with a checklist of Upper Cretaceous dinosaur remains from marine sediments in North America: Journal of Paleontology, v. 53, p. 566-577. King, D.T., Jr., 1995, Dinosaurian stratigraphy and modes of occurrence in the Alabama-Georgia Coastal Plain: Gulf Coast Association of Geological Societies Transactions, v. 45, p. 327-332. King, D.T., Jr., 1996, Alabama dinosaurs, 2nd. ed. : Auburn, Alabama, Auburn University Custom Publishing, 186p. King, D.T., Jr., and E.D. Jones, 1997, Late Cretaceous dinosaurs of the southeastern United States: Gulf Coast Association of Geological Societies Transactions, v. 47, p. 263-269. King, D.T., Jr., J.P. Abbott-King, G.L. Bell, Jr., J.P. Lamb, Jr., J.L. Dobie, and D.R. Womochel, 1988, Stratigraphy and depositional environments of the Turnipseed Dinosaur Site in the Upper Cretaceous Demopolis Chalk of Montgomery County, Alabama: Journal of the Alabama Academy of Science, v. 59, no. 2, p. 34-48. King, D.T., Jr., and M.C. Skotnicki, 1994a, Upper Cretaceous stratigraphy and sea-level history, Gulf Coastal Plain of central and eastern Alabama: Geological Society of America Special Paper 287, p. 27-42. King, D.T., Jr., and M.C. Skotnicki, 1994b, Parasequence-bounding sandy event beds, Upper Cretaceous, Alabama: Gulf Coast Association of Geological Societies Transactions, v. 44, p. 321-326. Langston, W., Jr., 1960, The vertebrate fauna of the Selma formation in Alabama, Part 4, The dinosaurs: Fieldiana Geology Memoirs, v. 3, no. 6, p. 319-360. Lucas, S.G., 1997, Dinosaurs, the textbook, 2nd. ed. : Dubuque, Iowa, Wm. C. Brown Publishers, 292p. Paul, G.S., 1987, Predatory dinosaurs of the world: New York, Simon and Schuster, 464p. Russell, D.A., 1972, Ostrich dinorsaurs from the Late Cretaceous of western Canada: Canadian Journal of Earth Sciences, v. 9, p. 375-402. Russell, D.A., 1988, A checklist of North American marine Cretaceous vertebrates including fresh water fishes: Occasional Paper of the Tyrell Museum of Palaeontology, No. 4, 58p. Schwimmer, D.L., 1997, Late Cretaceous dinosaurs in eastern USA: a taphonomic and biogeographic model of occurrences: Dinofest International Proceedings p. 203-211. Schwimmer, D.L., G.D. Williams, J.L. Dobie, and W.G. Siesser, 1993, Late Cretaceous dinosaurs from the Blufftown Formation in western Georgia and eastern Alabama: Journal of Paleontology, v. 67, p. 288-296. Smith, A.G., D.G. Smith, and B.M. Funnell, 1994, Atlas of Mesozoic and Cenozoic coastlines: New York, Cambridge University Press, 99p. Weishampel, D.B., P. Dodson, and H. Osmolska, editors, 1990, The Dinosauria: Berkeley, University of California Press, 733p. Weishampel, D.B., and L. Young, 1996, Dinosaurs of the east coast: Baltimore, Johns Hopkins University Press, 275p. Figure 1. Geographic distribution by state of dinosaur specimens described in paleontological literature between 1858 and 1997. Figure 2. Paleogeography of eastern North America, Western Interior Seaway, and parts of western North America during the Late Cretaceous (75 Ma; after Graves, 1993 and Smith et al., 1994). Outlines of dinosaur-producing states are indicated. Shoreline is indicated by a dashed line. Figure 3. Three modes of occurrence that are evident in Late Cretaceous southeastern U.S. stratigraphy: (a) shallow-marine concentrations; (b) shelf tempestites (or sandy event beds); and (c) open-marine accumulations (see text for additional explanation). Click her for larger version. Figure 4. Chronostratigraphic and geographic distribution of all specimens representing eastern North American dinosaurian taxonomic groups: tyrannosaurids (T); hadrosaurines (H); ornithomimids (O); and nodosaurs (N) (synthesized from charts in King, 1996). Maximum chronostratigraphic range of specimens from each state is shown by a vertical bar. Original data are from checklists in Horner (1979) Russell (1988) and Weishampel et al. (1990), plus Bryan et al. (1991). See checklists cited above for their specific literature references and personal communications concerning occurrences within each state. Asterisk (*) indicates "older theropod group" discussed in text. Scale on left side is age in millions of years. Figure 5. Curve of Late Cretaceous eustatic sea-level change, both second-order and third-order, adapted from overall Mesozoic sea-level chart presented in Haq et al. (1988). Absolute sea- level change is indicated at top where 0 m is sea level today. Sea-level falls at 80 and 85 Ma may be linked to dinosaurian migration across the Western Interior Seaway (see text). On scale at right, Ma = million years. Table 1. Total numbers of specimens described in paleontologic literature (1858-1997) are given in two columns at right, where the left column gives southeastern (SE-US) specimens addressed in this paper and the right column gives other eastern North American (E-NA) specimens (i.e., those from Missouri (1) and New Jersey-Delaware-Maryland (50)). This table was compiled from checklists in Horner (1979), Russell (1988), and Weishampel et al. (1990) and data in Bryan et al. (1991). RETURN TO David T. King, Jr.'s HOMEPAGE!